Discover whether your music exists among the millions of recordings that are due royalty payments. We think that all music creators should get paid fairly for their work. Knowledge is power, and that's why Analyze created this easy to use lookup feature for Iconic Artists. 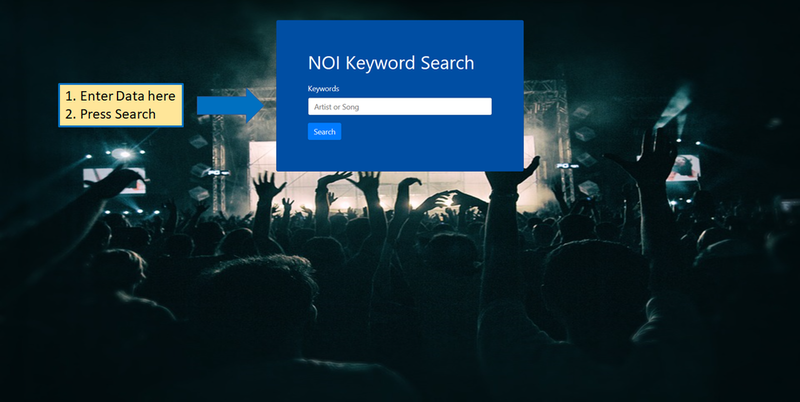 Iconic’s Notice of Intent (NOI) software is designed to help music publishers and songwriters search the more than 70 million "address unknown" Notice of Intention to Use filings made with the U.S. Copyright Office. If you are an artist, copyright holder or their representative, we invite you to search the online database (free of charge) to discover the songs that are owed royalties from the NOI's $1.5 Billion pot of unclaimed funds. Review the resulting report showing the related works that have money waiting to be claimed. The web-page shown above illustrates where the search process starts. Results will appear in a similar manner to the illustration shown above. Analyze developed this data analysis tool for Iconic Artists. Deriving valuable insight from vast amounts of data is what we do. For data analytic questions or concerns, contact Ed at ed@analyzecorp.com or fill out a customer form.